Artist Antonia Posey with painting "Eating Ice Cream in the Rain," which took best of show at The Starline Gallery's 4th Fridays art exhibit in Harvard, Illinois, 2014. Croz Pub and Grub in Twin Lakes, Wisconsin. This is where my series began. Bruce McCoy posing next to his painting, America the Working Poor, Portrait of Bruce (AKA Bar Creep), 2014. 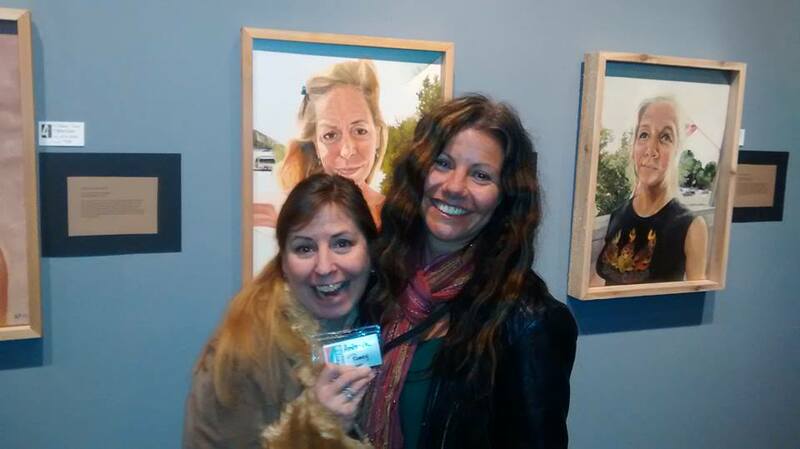 Artist, Antonia Posey, and Bonnie, standing in front of Bonnie's portrait, America the Working Poor, Portrait of Bonnie-Boo, 2014. Brian P posing next to his painting from the "Working Poor" series, 2014. I am a self-taught artist working primarily in oils. For as long as I can remember, I have used art to gain a better understanding of my surroundings and build emotional connections with others. Each piece of art I create tells a story because I believe every person’s experience of life informs us and brings us closer together as human beings. While painting has always been my passion, I only recently returned to art after many years in graduate school and working full time as a law enforcement officer. Perhaps more than anything else my experiences policing had a tremendous impact on my art; I became aware of unfair policies and the economic downturn of the past several years, which devastated families and local economies. In 2011, I resigned from the police force and moved to the Twin Lakes, Wisconsin area where I began working part-time at a small tavern. It was there I met a group of locals who inspired me to paint their stories, stories of the working poor. The “working poor” are working people whose incomes fall below a given poverty line. While poverty is often associated with joblessness, a significant number of poor are employed. Mostly because they are earning such low wages, the working poor face numerous obstacles that make it difficult to find and keep a job, save up money, plan for education or retirement, and maintain a sense of comfort. “America the Working Poor” began in 2012 with a single portrait, Portrait of Cindy. I was inspired by Cindy’s outfit, an eclectic mix of fabrics and patterns that she proudly wore on Valentine’s Day. I found both humor and hope in her image, posing for photos in the tavern parking lot; displaying with pride her modest bouquet of flowers that symbolizes the little things that can mean so much. From that single portrait a series evolved. Not to mention, a greater connection to the people and the area I was living. As I evolve as an artist, my goal is to create realistic images. I choose to use oil paint because I find it the ideal medium for representing details, forms, and figures, with a range of colors, shadows, and depths. With paint I seek to capture and present the intensity of human emotions, to provoke conversation, and to foster a better understanding of those who live in a state of working poverty; I am working poor…and probably so are you. Through strength of color, dimension, and perspective, my aim is to paint ordinary life with startling truth. While my series tells the story of working poor as a group of Americans who struggle to make it day-by-day, it also tells of us as individuals, each one possessing a unique style of actualizing themselves in spite of hardship. In time I will expand my series to capture working poor people in other locations across the United States.